If you don’t want to waste your money…don’t fly SW airlines Business Select. I did and I know it’s not worth it. It’s a "Start with Red" day! Looks like today is a ‘start with red’ day. 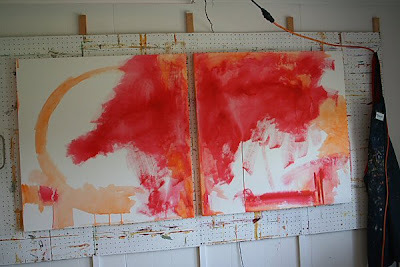 I’m back to working on the two 36 x 36″ canvases on the wall easel.Tired of waiting for painting payment to finalize. It will just have to wait while I paint since it’s too late for shipping today anyway. Texturizer (Nova Lightweight Texture paste) is on already and I started to pull out paint, thinking, “hum ..what undertone for this one?”. 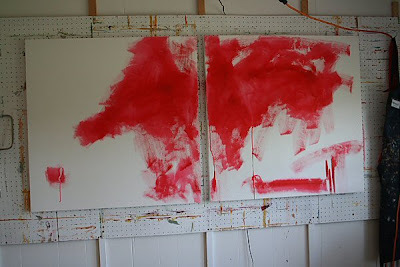 Then I decided on Napthol Crimson…..good a color as any and it’s transparent which I like in under-painting tones. Then on to the Cad yellow. Hum..kinda liked those first shapes. Why doesn’t the end ‘product’ turn out as spontaneously? WELL…..it can’t, of course, because you have to make a painting, not just play around when it comes down to it. At first though…fun to just start somewhere, anywhere, color or a mark. This one started with color and may not have any resemblance to the beginnings when I finally finish with it. I like color under my neutrals. Oh yeah….that sale finally completed…………will ship tomorrow.